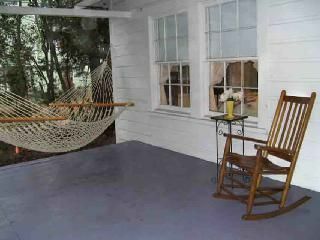 Sit on the front porch with a glass of ice tea and watch the birds and squirrels in the live oak trees. Enjoy a summer breeze by stretching out and relaxing in the hammoch for an afternoon nap. You can view the ocean from the road. Walk to the Third Ave. beach access in just two minute, viewing the beautiful Atlantic as you walk. It's like a private bed and breakfast! Great space for small families, retreats, girls week, honey moons, and special occasions. I love Myrtle Beach. It is my home away from home. I haven't opened this property up for rental in the last 4 years. It is now time to share this wonderful, historic property. It is offered for weekly stays. Check in is Saturday at 4:00. The screened porch has a table and four chairs for dining. The dining area in the house seats six people. This cottage features central heat/air, fully equipped kitchen, washer/dryer,3tv's. There is also a NEW REAR DECK, gas grill, large front porch, large screened porch, and private wooded backyard with a natural setting and its very near the ocean. Step back in time to the Myrtle Beach of days gone by or step off the front porch and into all of the fun and excitement that Myrtle Beach has to offer.! YOU CAN WALK TO THE BOARDWALK IN LESS THAN 5 MINUTES! Located conveniently in the heart of Myrtle Beach near the BOARDWALK, which features shops and restaurants, and beautiful garden pathways running 1.2 miles from pier 14 to 1st ave. The cottage is also near Family Kingdom Amusement Park, THE SKYWHEEL, The 2nd ave. pier and restaurant, Ocean Boulevard with all of it's shops and attractions, miniature golf, numerous championship golf courses and of course the Atlantic Ocean are all only footsteps away, but it feels very private. Two minute walk to the beach. There is a view of the beach from the front of the cottage.